← Importing video from a camera to your iPad. Your movie just doesn’t seem complete without a voiceover. Fortunately, you don’t have to hire a professional to record a voiceover in Apple iMovie. You can narrate a movie and add your voice anywhere you want in your video. 1. Click the Voiceover button and then choose your real microphone (or sound input device) from the window that appears. 2. Drag the input volume slider so that it matches the loudness of your voice. 3. Select the Play Project Audio while Recording box if you need to hear sound as you record your voiceover. 4. 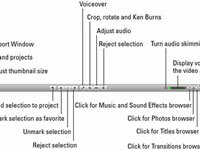 Click anywhere in the project to stop recording.